It's a Misfits cover! and space philosophy! And embarrassing gender norms! 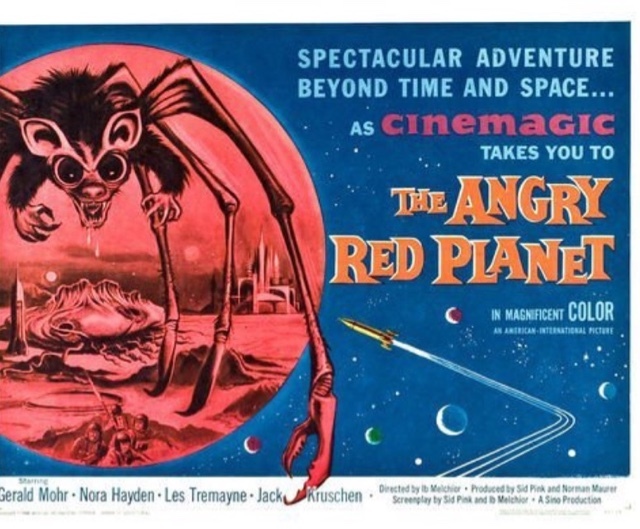 If you're a fan of The Misfits and remember the giant spider-crab-thing on the cover of Walk Among Us, welp, that's from Angry Red Planet, and it's what got me to watch Angry Red Planet. In a lot of ways, this movie is your standard dose of 1950s sci-fi, except everything has an exclamation point after it. The opening Army-types-around-a-table-explaining-everything scene is like the one you've seen a million times, but the science is all a little more made-up sounding, the uncomprehending stares are a little extra confused, and the marching orders are just a bit more incomprehensible than usual. It's a truly fantastic scene. So, look. I'm writing this review in a Vegas diner, which is kind of perfect, because Vegas is like America with an exclamation point. And I think "America With an Exclamation Point...In Space!" could have been the tagline of this movie. But what I can't figure out is if the filmmakers did that on purpose. You've got heedless destruction — to test their freeze ray, the astronauts blithely destroy some native Martian vegetation and then cheer when it shatters like glass. Their first reaction upon seeing alien life is to blast it! Blast it!!!! You've got upsetting gender assumptions — the female astronaut thinks she must be nervous as one of the first four people on a new planet "because she's a woman." You've got the fetishizing of guns — the guy who gets to wield the freeze gun loves it, and pets it, and damn near calls it George. But the most remarkable thing about this movie is the goddamn bats. No. Not the bats. The neon. Wait...sorry. Almost. Vegas, you know? You know how in The Martian it looks like Matt Damon's on Mars? Well in Angry Red Planet it looks like they're in a picture taken at The Bellagio gardens and then ruined by Photoshop filters. Dubbed the "Cinemagic Process," all the scenes on Mars appear to be dyed red. It's not actually that simple — I couldn't figure out exactly what was happening. Suffice to say somebody went wild with the Filter Gallery back when that could only be achieved photochemically. It's legitimately captivating. But all of this, like Las Vegas itself, begs the question of who is in on the joke? See, it's one thing to watch this movie and think, "Damn! It's a miracle we didn't blow ourselves all up!" But at the end of the movie (Spoilers? I don't know. Probably not.) the astronauts decode a message from the Martians that says Earthlings (read: "Americans") are "scientific adults but intellectual children." For as much as this movie echoes the themes of other, better movies, this is maybe — given the hindsight provided by history — the most clear-eyed assessment of 1950s America that I've heard. But it's impossible to tell if everything that has come before in this movie was designed to reinforce that idea, or was in spite of it. Maybe I'll ask the ghost of Hunter Thompson. Bonuses: +1 for the dialogue in the opening scene; +1 for being on a Misfits album cover; +1 for Cinemagic! Posted by Vance K — cult film reviewer er and co-editor of nerds of a feather since 2012.